Composed of natural assets with exceptional virtues, C Centifolia Organic Moisturizing Mask nourishes and soothes your skin. Aloe vera provides the necessary hydration and ginkgo biloba protects your skin from cellular aging. Your skin is soothed and regains all its flexibility. Its soft and fresh texture is very pleasant to apply. It brings you a feeling of immediate comfort. Practical thanks to its tube format, you can take it with you. 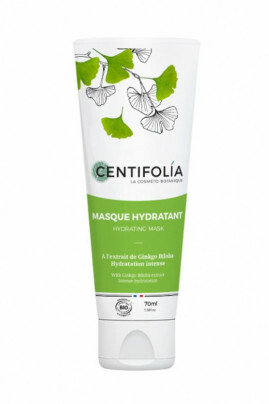 The Centifolia Organic Moisturizing Mask provides softness and hydration to your skin! On clean, dry skin, apply the organic mask in a thick layer on the face and neck. Avoid putting on the eye contour. Remove excess with organic cotton or rinse directly with clean water. You can use this treatment 1 to 2 times a week.